Grow your business and reduce costs with tablet and smartphone apps. Address your customer needs, business challenges and market opportunities. Increase sales, improve customer service and strengthen your brand. Accelerate your results by learning from others through case studies. Ensure success with cutting-edge frameworks, toolkits and strategies. Accelerate your strategy creation, implementation and market success. Be a pioneer in the biggest technology transformation the world has ever experienced. 125 compelling videos make it one of the world’s first Smartphone Video Books, bringing exceptional mobile marketing strategies to life and augmenting your learning experience! 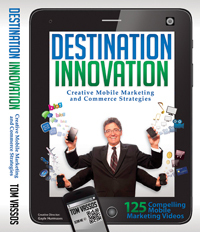 A World Tour of hundreds of mobile marketing Success Stories from over 20 countries. Frameworks and Toolkits to help you plan, prioritize and execute your own successful and innovative mobile marketing and/or mobile business plans. Worksheets that will guide you in crafting your own business model and mobile marketing strategies.5. Links to hundreds of comprehensive articles and case studies that cover each of the book’s topics and case studies in greater depth. Tom Vassos (BES, MBA) has taught business model innovation, technology and mobile social business MBA courses at several universities over the past 30 years. Tom has spoken at events in 43 countries and is a frequent Mobile Social Media guest expert on various television networks. I clicked the link to this site by accident, but wanted to see this post! I’ll be back! Thanks! Pretty great post. I simply stumbled upon your blog and wanted to say that I have really loved surfing around your weblog posts. After all I will be subscribing in your rss feed and I am hoping you write again soon! Great – I should certainly pronounce, impressed with your website. I had no trouble navigating through all the tabs as well as related information ended up being truly simple to do to access. I recently found what I hoped for before you know it at all. Quite unusual. Is likely to appreciate it for those who add forums or something, site theme . a tones way for your client to communicate. Nice task..